The global wine business is very conservative and at the same time extremely competitive. To be successful, it is important to understand some of the key trends. In the last 15 years, global wine production always surpassed consumption (In 2017: 270m hl vs. 240m hl). That creates a sales pressure on the market. New producers are constantly joining the industry. Many of them are from emerging wine countries like China. In these countries, contrary to traditional wine regions of Europe, areas under vine grow at a steady pace (4% YoY). There is a shift among wine consumers: millennials are taking an increasingly important role as wine drinkers. They represent 95 and 75 million people in Europe and the US, respectively. In comparison to traditional wine consumers, millennials show very different social and buying patterns. They are digital natives who spend at least 2 hours online with 90% of them using a smartphone. As price-aware individuals, 55% of them use social media to collect product information before making a purchase. Their buying decisions are influenced by the price, the perceived quality, the engagement with the brand and their experience in the store. 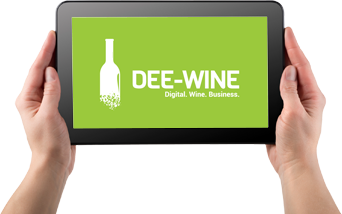 b) the most important asset for wine businesses becomes the customer itself. Wine businesses should own the customer (relationship). Think of it as your control stick to the business. If you do not know the customer, the future of your wine business is not in your hands. If your winery is selling wines through distributors and partners, you do not own the customer. Do you sell to a supermarket chain? They own the customer. Should the supermarket decide to change its portfolio and replace your winery with another supplier – too bad, you lost the business. Selling through partners exposes your winery a lot! Wineries in the US understood this – that is the reason why direct-to-consumer sales grew 170% in 2017. 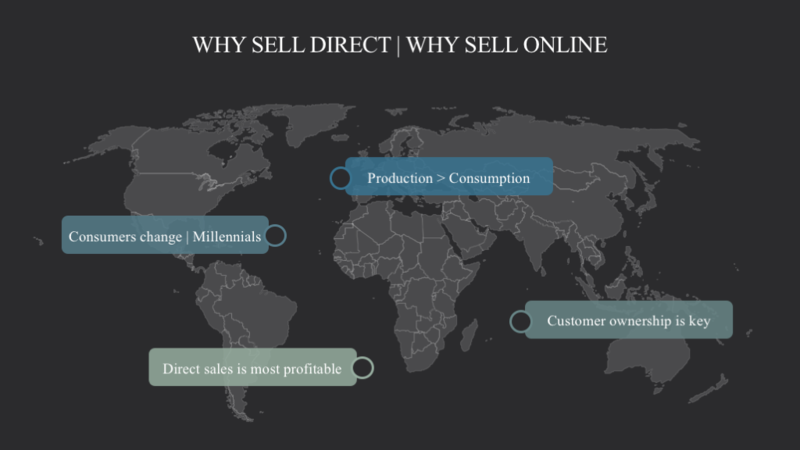 Selling directly is not only more profitable (distributors often ask for 50-60% discounts from list prices), it also ensures that you manage that customer relationship yourself. Although wine sales are increasingly moving online, it does not mean that the cornerstones of customer ownership should change. 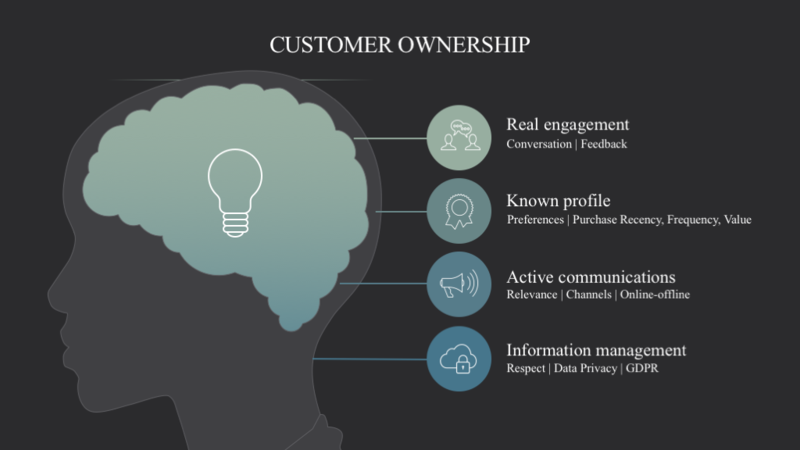 Customer ownership is still about 4 major things: engagement, knowledge, communications, and information management. In traditional brick-and-mortar wine shops, the show owner used to have a conversation with his customers. They remembered what wines the customer bought, asked for verbal feedback and engaged in a personalised discussion. In the online world, social media platforms enable you to run this conversation in the virtual space. That is something many wineries get all too wrong: social should be about a conversation with the consumers which rarely happens when you only talk about yourself and your wines. You should initiate a conversation and listen! In traditional wine retail stores, the shop owner also kept (at least in his mind) track of the purchases of his customers. That has been essential to understanding the customer’s preferences in order that the right wine would be recommended during the next visit. If you are selling wines online, you should do the same: analyse your customers’ purchase behaviours – understand when they bought last time, how frequently they purchase wines and what is the annual monetary value of those wine purchases. Knowing the profile of your customers should be the basis for adjusting and personalising your communications with them. Think of it like this: would you be happy when you enter the wine retail shop and the first thing the shop owner would say is that you should now buy a sauvignon blanc from New Zealand because it is on sale? If you happen to be a red wine fan then you could not care less. Having heard the same offer 2-3 times during your visit would perhaps upset you so much that you would leave the wine store and never return. Relevant communications are what really matters. Whether you talk to your customers face-to-face or through an online wine promotion, you have to make that conversation relevant. That is why customer knowledge is so important – your online wine promotions should be targeted at the right audience in order that it is relevant (and ends up in a wine sale). In the online space, you collect information about people. Some of them are only leads, i.e., people with a potential interest in your wines. Others are already your customers. You perhaps store their names, e-mail addresses, website visiting history, wine purchasing behaviour and preferences – lots of personal stuff. You have to handle all this information properly. You should use it to improve your knowledge of your customers and adjust your wine promotions accordingly. But you also have to respect the privacy of the information that people share with you. If they only agreed to receive newsletters from you about what happens in your wine business, then it does not authorise you to send unsolicited promotional wine offers. GDPR is very clear about this – store and use the information for what your customers agreed to. Whatever you do in the physical and online space to boost your wine sales, never forget about the 4 factors that drive the customer relationship. Ultimately, customer ownership is your most important asset that determines the success of your wine business.